Orgone and the energetic healing potential of orgonite is based on the research of Dr. Wilhelm Reich, an Austrian psychiatrist. He observed a bio energetic force within all living organisms while researching the physical effects of emotion on the body. He named this energy Orgone and developed powerful healing devices from his discovery. Since his death in 1957, many have continued his research and have discovered that the suspension of metals and quartz crystal within cured polyester resin, results in the formation of a matrix which aligns, magnifies, and directs healing Orgone energy. The final product is called orgonite. 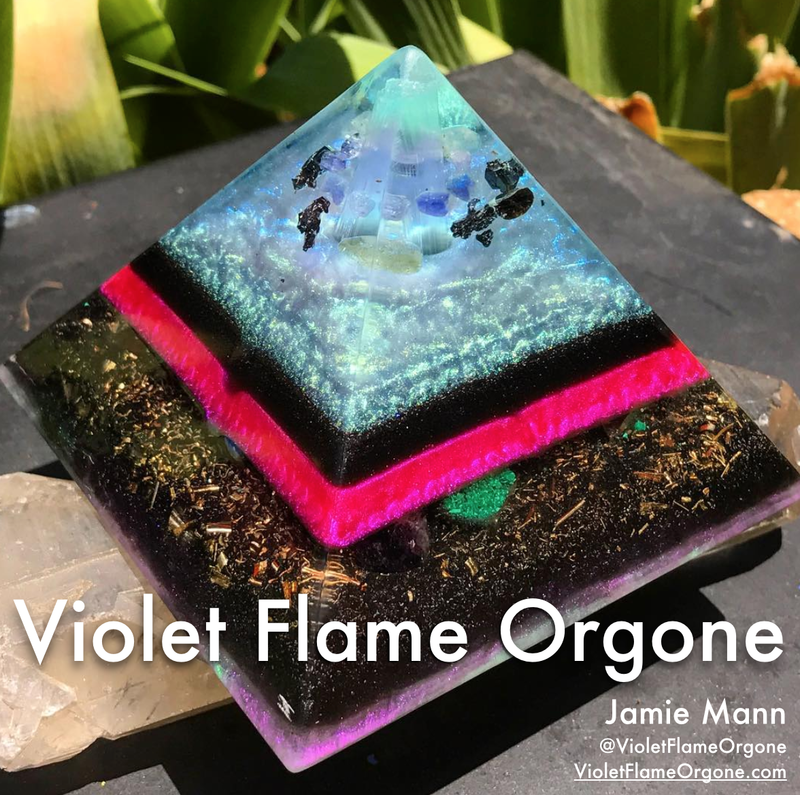 When Jamie became a regular customer, we were not only enamored by the sheer beauty of the pieces that she was creating, but we were intrigued to learn that the chemical properties and behavior of polyester resins accentuate and even magnify the effects of the various metal and crystals used in orgonite. I use polyester resin because part of its molecular structure includes a chain of carbon atoms – making it an “organic” compound, which attracts energy. It also has a high rate of shrinkability when curing, which creates extra force on the surface of the quartz. This pressure magnifies the already present electrical charge on the surface of the quartz, amplifying the holistic healing properties of this abundant mineral. 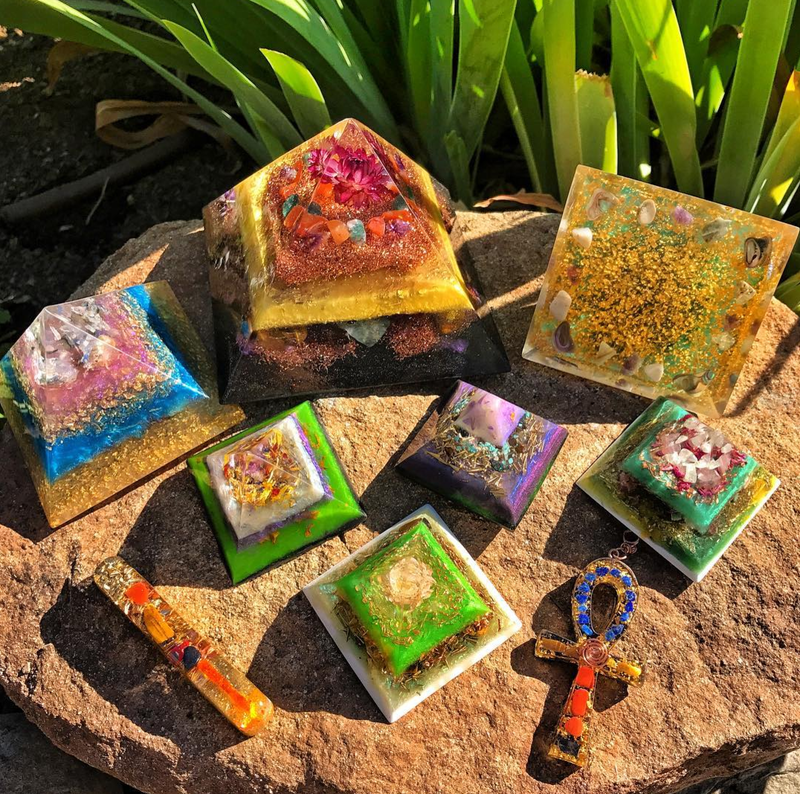 The new generation of Orgone devices balance the harmful effects of modern pollutants on the environment and ourselves. The quartz crystal receives a significant energetic charge on its surface from the compression of the resin on the quartz during the curing process (piezo electricity). Polyester resin has a significant capacity to absorb electromagnetic energy and the metals both attract and reflect these energies; a powerful trinity that is greater than the sum of its parts. Obviously, we needed to know more. We asked Jamie to explain more about her process. I use Fiberglass Hawaii’s MEKP, resin tints and workshop supplies. I start out with a mold and energetic intention and a crystal combination to support the realization of the intention. I pour in multiple layers over anywhere from 2 to 10 hours. Some of my layers are only a quarter of an inch, so the biggest part of my learning curve has been adjusting the amount of catalyst so as not to have cracks in my final pieces. Prior to starting Violet Flame, I had ZERO experience with resin of any kind. Learning the right ratios of catalyst has been the largest learning curve for me. I need it to be glass-smooth but, without cracking. Also, based on inspiration, I will choose different tints for color. I also use your wax in my final layer to make the post curing sanding process easier on my arms. As for the raw materials encased in the resin, I use metals of varying kind and density. My favorite metal is copper. Copper has a more feminine energy and is a fantastic conductor of energy. I also use a lot of different types of minerals and I always use quartz for the piezoelectric effect and to enhance the energy cleansing potential of the orgonite. Living in Ojai, I am surrounded by an abundance of flowers, plants, trees and bees. I spend some days gathering fallen flowers, leaves, etc. to use in my pieces in order to connect more deeply to the healing energy of Mother Earth. 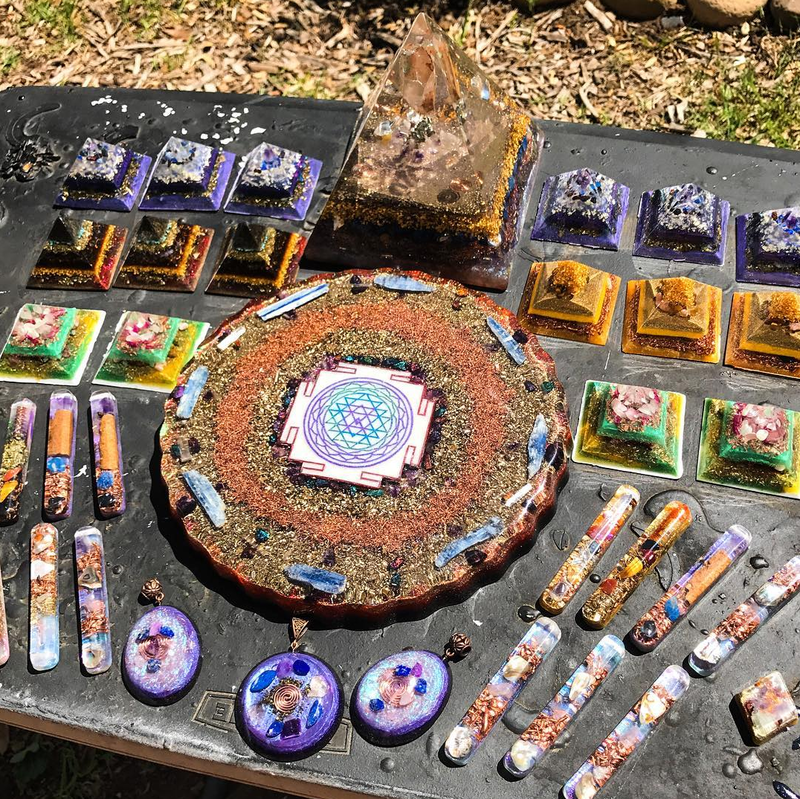 Orgone is a relatively untested “science.” So, in my years of creating orgonite, I have really surrendered to the subtle energy healing potential of my work. I create each piece with a prayer for it to help people hone their own internal intentions for healing, growth, and ultimately to find a greater sense of peace in their lives. Learn more, purchase a piece and follow Jamie’s work on social media.